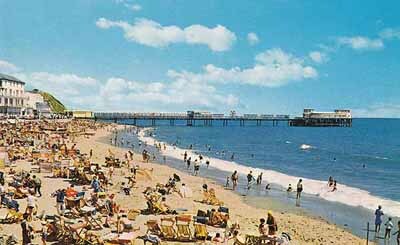 The new Royal Victoria Pier at Ventnor (actually, the very heavily restored/modified 1880's pier) was opened in 1955. It was 683 feet long with glazed shelters along its length. At the end of the pier was an entertainment area with bar, sun deck, a coffee bar and more. In the mid 1960's, the landing stage needed maintenance and, as steamer visits were much reduced, it was decided to repair only 100ft and to demolish the rest. In 1985, the pier was damaged by fire and although plans were proposed to restore the structure by Ventnor Town Trust, insufficient funds could be raised and in 1993, the remains of the pier were demolished. Ventnor harbour has now been built in place of the pier.